There is a concept of civitas in art, intended as a position of responsibility and activity in the world, that operates not only at local level, but that considers the entire planet as its home. In the cosmopolitical vision of the civitas of art, local becomes global. At Cittadellarte the relationship between art and sustainability surpasses the dimension of simple proclamation to enter into the sphere of projectuality, the world of doing. Inhabiting – living in a house – is the primary joint in the organic relationship between person and environment, where society is shaped and organized. Cittadellarte considers a house as a living thing, part of nature, the point where man and the surrounding world meet. So “Inhabiting” comes to appear as a man’s third skin – after his epidermis and clothes – and as a global habitat. The awareness that architects are one of the main factors in shaping the man-made environment, and that every decision they make deeply affects the surrounding world, is the principle that inspires the Architecture Office, whose activity is aimed at giving Architecture a strong ethical, cultural and technical commitment to transform the surrounding territory, the town and the house into a living being. The office designs and builds according to the principles of Natural Architecture, working towards integration in a broader social system and aiming at a balance between nature and man-made objects. In 2008 the department n.o.v.a. 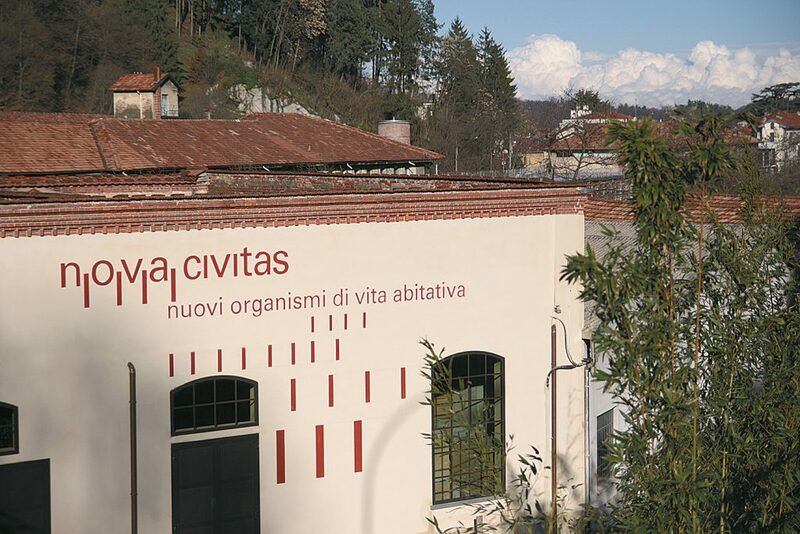 civitas Nuovi Organismi di Vita Abitativa s.r.l. was born within the office. The new branch deals with the building and marketing of natural or recycled products and materials. Together they promote sustainable architecture and building through exhibitions, events and various activities dedicated both to the building trade and to the citizens, to develop their awareness of the product they are enjoying, which unites high quality to social responsibility. The Museum of the Future is built by working and acting on what we would like to fulfill in tomorrow’s world: it is a commitment to produce in a new way. The Museum of the Future represents a mentality which is after concrete, non-visionary opportunities of sustainable development. It comes across as a delicate attitude towards the environment and its preservation. Its halls currently host practical and research activities, inspired by the principles of Natural Architecture and bio ethical and sustainable Fashion. The architectural approach behind the restoration of the Museum of the Future considers the building as a new inhabited body, its walls wrapping it like skin, with a considerably thick insulation layer and small-size electric generators that supply a heating and cooling system based on solar energy, natural ventilation, non-conduction green roofing and glazing with reduced thermal loss. The plant engineering employs state-of-the-art technologies that combine ease of use, reduced consumption, physical wellbeing and natural materials. The design has preserved the original structure in solid bricks, bringing the energy requirements of the whole complex down to a minimum, despite the unfavourable climatic conditions, the less-than-ideal frontage of the main façade and the poor sun exposure during some months. A ventilation honeycomb structure was created underneath the office section, and a solid wood slab was laid down, raised 25 centimeters above the treading surface. The new structure was covered with waterproof, insulating sheathing and oak-stave flooring, resting unmortared on mineral granulate and treated with honey- and essence-based oils. Natural lighting is controlled by means of blinds, selfadjusting according to the position of the sun to prevent direct exposure and therefore overheating, especially on the south and west façades. During the summer, the skylights in the flat ceilings above the office section and the sloping roofing of the exhibition halls allow the building to cool down during the night, thanks to natural ventilation and the walls’ thermal inertia, thus limiting heat build up during the day. The roofing of the former power station’s halls were rebuilt in a double layer, the main structure being made in laminate wood plus an insulating lining in mineralized wood wool and fibers. The roofing of the office section and of the exhibition hall on the north side, along the Cervo torrent, are flat; the former is slated, the latter is a green roof. Green roofing was chosen for the exhibition hall because of the commitment to comply with sustainability requirements, not only on the basis of its high thermal performance, but because of its considerable role in reducing fine dust and greenhouse gases in the atmosphere. The external walls of the entire building were insulated by lining them internally with cork boards. These, in turn, were covered with a double layer of clay, a natural material that guarantees perfect thermal and humidity balance. The external surface was treated with hydraulic lime. Such multi-layering makes the walls perfectly transpirant. Special care was taken in the selection of the furniture, so as to comply with the sustainability principles that inspired the whole renovation. All desks are in solid oak, assembled with special clutch joints and without using glues. The bookcase, the furniture and the fittings are in oil-coated black steel, all of them custom-fitted. All chairs for the offices and the meeting room are eco-friendly, recyclable up to 94% and made up for at least 35% of recycled materials. Last but not least, local companies and craftsmen were chosen to carry out the restoration. They were exposed to an on-going training on technologically advanced natural materials, an important factor for the success of the project that also contributed to the diffusion of this “building style” in the area. All materials have natural origin, they are recyclable, transpirant and compliant with environmental requirements, both Italian (ANAB-ICEA) and European (naturalplus). For painting and plastering natural materials were used, of vegetal or mineral origin (natural hydraulic lime, clay, paints made with vegetal chemicals); the bearing beams are in firwood coming from certified forests; all materials for treatment have vegetal origin, such as the linseed oil for wooden structures; all insulators are in wood fiber, cork and clay paste; all floors are in oak and pozzolana mortar. Dry-laying is the main building technique that was used, in order to reduce the environmental impact of the worksite and at the same time making it cleaner, faster and more efficient. A radiant, in-wall, mild-temperature copper-pipe heating and cooling system was installed. This ensures high comfort and a rational and equalized heat distribution, at the same time bringing energy consumption down to a minimum (45 Kwh/m2/a – class B), requiring little maintenance and causing little dust movement. The coils of the radiant panels were coated with clay-based plaster. The machinery, running on bio-diesel oil, is powered by a small-size generator supplying 45 Kwh (in heat) and 20 Kwh (in electric power). A radiant, in-wall, mild-temperature copper-pipe heating and cooling system was installed. This ensures high comfort and a rational and equalized heat distribution, at the same time bringing energy consumption down to a minimum (45 Kwh/m2/a – class B), requiring little maintenance and causing little dust movement. The coils of the radiant panels were coated with clay-based plaster. The machinery, running on bio-diesel oil, is powered by a small-size generator supplying 45 Kwh (in heat) and 20 Kwh (in electric power). The Architecture Office and n.o.v.a.civitas Nuovi Organismi di Vita Abitativa s.r.l. are involved in the project for the sustainable recovery and renovation of the buildings recently acquired by Cittadellarte, a vast industrial archeology complex subjected to the Soprintendenza per i Beni Architettonici e per il Paesaggio del Piemonte (Office for the Protection of Architectural Heritage and the Landscape in Piedmont), located in the area of the River Natural Park of the Cervo Torrent, next to the original nucleus based at 27, via Serralunga, Biella. The complex is made up of industrial-type buildings, erected during the late 1800s and the early 1900s. Thanks to Cittadellarte the area is experiencing a revival of activities, and has become the stage for creative initiatives that focus on art as the center of a responsible transformation of society. The recovery of the entire complex, which covers a total area of approximately 27,000 square meters of which 21,500 are roofed, can be divided into five different areas, with specific assignments. Through a north-tosouth description of the various sections it is possible to obtain the overall view of the entire project, which brings together the diverse requirements coming from Cittadellarte’s intense activity. Section 1 – Formerly the Emilio Trombetta Wool Mill. It was acquired in 1991. During the following ten years it was accurately restored and preserved, both in the noble, eighteenth-century wing and in the “manchesterian” section, dating back to the mid-1800s. This is what represents the original core of Cittadellarte. It covers an area of 7,000 square meters on four storeys, where the Foundation carries on its organizational and productive activities, holds its exhibitions and conferences and has its Cafeteria and Store. Section 2 – the residential building of the former industrial complex Maurizio Sella. Known as Casa Ponte Cervo, it housed the employees of the Sella spinning mill at the end of the 1800s. After a series of unauthorized, privately conducted restorations, which radically altered its nature and disrupted the original layout of the apartments, the project includes the creation of Guest Quarlotto ters, with a series of suites, complete with facilities, that will increase the accomodation capacity of Cittadellarte. As for total cubage, the façades, the entrance stairway and the stone masonry of the bearing structure, the restoration will aim at maintaining the building as similar as possible to its original structure and appearance. However, all the internal additions built over the years will be eliminated, in order to create a modern, perfectly sustainable hotel facility. After the restoration, a total space of 1,500 square meters will be available. Section 3 – industrial settlement, formerly the Canova wool mill. It is made up of industrial-type buildings, dating back to the early 1900s, covering an area of about 7,000 square meters. Before being acquired by Cittadellarte, the premises were used for yarn production and hosted warehouses, offices and workshops. This estate will be subdivided into three areas, that will be assigned respectively to the Museum of the Past, which will house works by Michelangelo Pistoletto and other artists of Arte Povera; to the Museum of the Present, a large exhibition hall for young contemporary artists; and to the Museum of the Future, made up of two main sections. One dating back to the 19th century and originally a hydroelectric power station used by the Sella spinning mill; the other, more recent and dating back to the early 1900s, for textile industry activities. The area is presently assigned to the activities of Architecture Office, n.o.v.a.civitas Nuovi Organismi di Vita Abitativa s.r.l. and to the Fashion Office of Cittadellarte. Section 4 – industrial settlement, formerly the Angelino Foundation – an estate covering about 3,000 square meters, made up of structures of different kind and dating back to different periods built around a common court, assigned to the activities of the Centro per l’educazione e la formazione continua (Center for on-going Education and Training), with areas assigned to the Scuola Libera Maria Montessori - Cittadellarte, to professional training and to the center for creative recycling ReMidaBiella. Section 5 – the earliest industrial settlement of the former Emilio Trombetta Wool Mill – presumably built around 1840, it represents an important example of industrial archeology, under the tutelage of the Italian Ministry for Cultural Heritage. Once restored, the 3,000-square-meter area will house the Center for Art and Cross-cultural Activities.